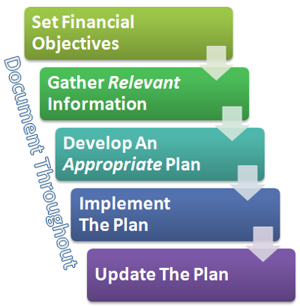 The goal of financial planning is to identify your objectives (personal and financial) and achieve them. Your financial advisor will guide you. This step is often called fact finding. what is your current financial position? There may be several iterations as you and your advisor make refinements. Unless your financial plan gets implemented the whole process and plan are worthless. This is not the time to hesitate. The onus is on your financial planner to motivate you to take action in your best interests. The future will not unfold as we expect. To stay meaningful, your financial plan needs to be updated as your circumstances and economic conditions change. You might want an annual review. TIP: Pick a planner who you think will give you post-sales service during the upcoming months, years and decades. This isn't as much a step as it is part of the whole process. Memories fade and disagreements can occur. You should also keep your own records and carefully review correspondence you receive. Written communication provides you an audit trail. With services like Gmail providing permanent online email, you can painlessly archive and search your records.